Mother’s Day is right around the corner and for most adults, figuring out the best gift or celebration for mom or grandma can be a daunting task. For someone who has seen 40 or 50 of these celebrations, the same old bouquet of flowers or department store gifts can feel a bit repetitive. That’s why this list of Mother’s Day gift ideas is going to offer something different from the usual bathrobe or trip to the spa. 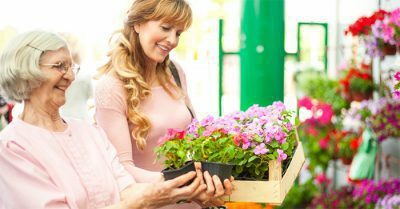 These five ideas for seniors are all centered around building your relationship with Mom, spending time with the woman that raised you and helping to create new memories on this special day. Nothing can bring a smile to a mother’s face like a family meal. Depending on the size of your family, consider booking a reservation or room at a local restaurant and invite family, and loved ones to eat brunch or lunch together. Not only will she enjoy going out for a meal, but the fact that someone else cleans up afterward will be an added bonus. The best gift to give and receive is always time with those she loves. This is one that the grandkids can especially have fun with. Bring all the necessary supplies to grandma’s house for a morning or afternoon spent making a DIY gift for her to keep. It can be as easy as putting together a scrapbook of old photos or maybe a collage from a favorite vacation. The grandkids can draw and color in titles on the pictures while the adults handle the cutting and pasting. For ideas and inspiration, browse around Pinterest with her. In the end, she will have a beautiful keepsake to cherish the day and her memories. Jump in the car for a trip to an old house or neighborhood that was important in her life. This will prompt her to discuss what it was like for her growing up or what it was like raising you and your family in a certain house. Either way, it’s nice to get out of the house and you will gain a better understanding of her perspective and memories of a life well lived. For those Mothers living farther away from home, take a figurative trip down memory lane. Watch old home videos or bust out the photo albums from when you were a kid, and let mom re-live some of her favorite memories with you by her side. Grab her favorite movie on demand, bring the popcorn and candy, and settle in for a movie night with her and any other family members nearby. Make sure to let Mom pick the movie, and act as her personal waiter/waitress for the evening; bringing her popcorn, a blanket, and cleaning up as the credits roll. Mother’s Day marks the official kickoff of the gardening season, and also the opening weekend of local farmers’ markets. Spend time helping your Moms home look professionally landscaped by planting and gardening at Mom’s house while she relaxes. Often times farmers’ markets and home improvement stores will take advantage of the holiday and put out their flowers and plants for planting. Farmers’ markets, in particular, are a great place to grab a unique plant or even a fun accessory you can help install in the garden, such as a birdhouse or new planter box. Spending time outdoors at Mom’s house will help her home look fantastic and give you lots of time to bond with her. Also, consider planting something that you and she can tend to and check on during following visits. No matter how you spend your Mother’s Day, we hope your time spent with mom, grandma, and family is filled with health, happiness and love. For any questions on SameAddress concierge or in-home care services, call us today at 1-866-SENIOR-1.